Elephants are known for their majestic size and resilience, but also for their long lives. In fact, elephants live longer than any other land mammal, except for man. Unfortunately, a number of factors affect the life span of elephants, both in captivity and in the wild -- and humans play a big part in that. Elephants can live up to 70 years in the wild. The truth, however, is that few reach that age. According to a 2008 study published in the journal "Science," African elephants live a median of 56 years in the wild, while Asian elephants live about 41.7 years. The shorter life span is due to poaching or illegal hunting for ivory or other uses, destruction of habitat and drought. Many animals live longer in captivity than they do in the wild, simply because being captive means there are no predators around. However, the elephant is an exception. According to an article in National Geographic News, elephants in zoos live shorter lives than elephants in the wild. And the differences are pretty significant as well: an average of 17 years in a zoo against 56 in the wild. Although scientists are not sure why this happens, two possible reasons are obesity -- and the health issues this carries -- as well as the stress of captivity. 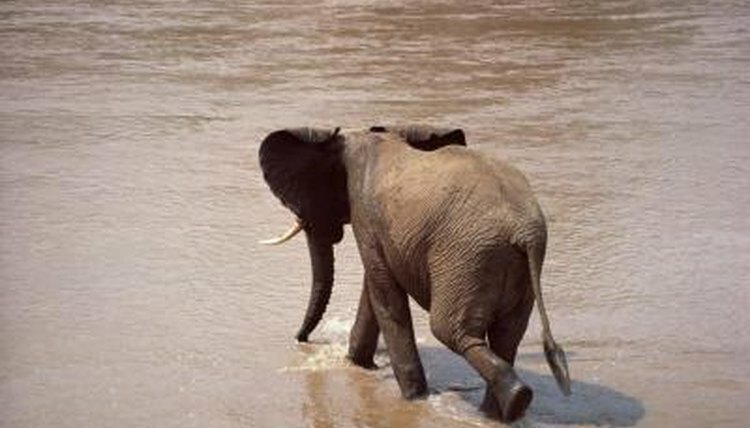 Illegal poaching is a serious threat to the life of wild elephants. Male elephants are hunted primarily for their tusks, but both males and females are also hunted for other reasons as well. According to organization Ele Aid, Asian elephants are also killed for medicinal use and for their hide, which in Asia is used to make high-end furnishings. Destruction of habitat happens in both Asia and Africa, as humans expand cities into the elephants' territories or eliminate sources of water. Elephants are highly social animals, and the stress of captivity often results in shortened life spans. In the wild, elephants also move constantly, migrating for miles throughout the year. The confined spaces they must live in when captive also causes them a great deal of stress. Finally, the herpes virus has also been the cause of deaths of many Asian elephants in captivity. This is because captive Asian elephants are often infected with a lethal form of the herpes virus contracted from African elephants -- a mix that would never happen in the wild because the two species don't share any common ground.